Lesotho’s national budget is often a mixed bag of aspirations if not a wish-list by government in its pursuit of development of its people. In modern day budget formulations, expectations are growing among the ordinary citizenry to partake in the process, which has however been the task restricted to government until the point when the finance minister surprises the nation during the national budget speech. Even members of parliament, at least in the case of Lesotho, can only make their contributions after the budget speech has been made. It is against this backdrop that the nation, in particular the working class in the public sector, reacted in shock and disappointment at the announcement of a four percent salary increase by the Finance Minister Moeketsi Majoro a fortnight ago. As if that was not enough a blow for the public servants whose expectations were much higher, Dr Majoro opened another missile announcing hike of value added tax (VAT) by one percent – from 14 to 15 percent. Taking into account Lesotho lacks a thriving private sector, a large chunk of the working class is the public sector. 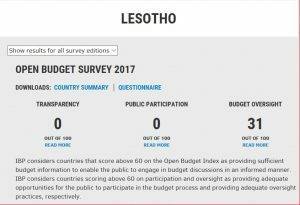 That Lesotho’s budget formulation remains a restricted task by the government to work is a notion observed even by the International Budget Partnerships (IBS), through its study called the Open Budget Survey (OBS). The IBP is an organization working on international advocacy on advancing global norms and standards for budget transparency, accountability and participation. 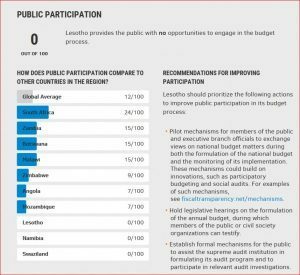 In its 2017 biennial OBS, Lesotho is ranked among six countries, namely Equatorial Guinea, Niger, Qatar, Venezuela, and Yemen, that made no budget documents publicly available. The OBS report further makes a number of recommendations for the country to increase budget transparency, accountability and participation. Now, various stakeholders like teachers and security agencies which are directly paid from the state coffers, argue they are never consulted during the budget formulation. It is undisputable public servants remain a resourceful arm of any government, although the extent of their effectiveness remains a catchy debate. These are the people who continue to earnestly listen to the speech and wait anxiously until the minister gets to the bottom of his presentation where it has become a norm to announce the increment. Well, we don’t remember the last time civil servants were happy after this moment. An independent survey conducted by the MNN Centre for Investigative Journalism following Dr Majoro’s budget speech, that was filled with mixed emotions, suggests it is high time the nation is actively engaged in budget formulation. Public officers interviewed these journalists indicated Dr Majoro’s 2018/2019 financial budget proposal, like many that came before it, made them think he was saving the best for last. But they were shocked at his announcement of the four percent increment they said was paltry considering the inflation rate, among other factors. Having proved himself to be a financial pundit in the eyes of many Basotho, Dr Majoro was ostensibly expected to deliver a miracle – turn the Kingdom’s economy from abyss to suddenly a land of milk and honey. For the many who envisaged lavish lifestyles, dreams were shuttered. The minister also said in his proposal that government intends to turn around the country’s unsustainable fiscal outlook by introducing new revenue mobilization initiatives. These, he said, included an increase of the 14 percent VAT by 1 percent to make it 15 percent and many other taxation and revenue collection mechanisms. But it is a strong view of various stakeholders angered by these increases that they should have been consulted in the formulation of the country’s national budget as a 4 percent increase to their salaries does not match the many taxation changes the 2018/2019 budget proposes to parliament. ’Mapitso ’Molai, General Secretary of Lesotho Teachers Trade Union (LTTU) said in a recent interview with the MNNCIJ that the country’s teachers’ population was not happy with meagre increment. “Ntate Majoro’s four percent is just too little for our needs,” lamented ’Molai. Her president, from the same teachers’ union, Alexis Lesia, shared similar sentiments adding in a time when the country is hard hit by poverty and hunger, most of the teachers they represent were breadwinners for more than one family. Lesotho Public Service Staff Association (LEPSSA) – Maseru District spokesperson, Rantalele Seakhi, said the increase was just too low for the low-income earners within the public service. However, Seakhi’s biggest worry is that government never considers low income earners opinions when formulating the country budget proposal currently under discussion in Parliament. Seakhi argued the national budget formulation process remains an elitist financial policy document that has continuously drawn without the people being given a platform for participation. “We’ve always asked to be given a chance to be heard through consultations before the budget speech is presented to parliament because once it in parliament, we know it will never be changed,” said Seakhi. LEPSSA’s National Spokesperson Tebello Sello corroborated Seakhi’s argument while also revealing that for the first time in history their LEPSSA representatives were warned by Public Service Minister not to get their hopes high as Majoro’s budget proposal is about turning the country away from an economic quagmire and spurring economic growth above everything else. Sello said LEPSSA continues to hold a strong view that the budget formulation process should include various stakeholders and not government so that low income earners opinions can be heard.